This was my first wedding at the Temple of Peace in Cardiff. I realised when meeting Fereida, sister to the bride at the venue beforehand, that the acoustics could be interesting. I decided to ensure that the sound was audible everywhere with minimal reverberation. 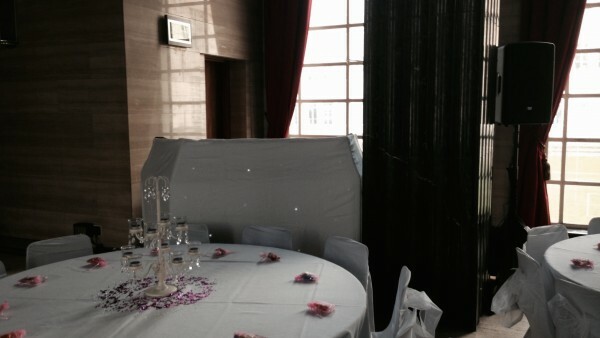 I did this by positioning 4 speakers facing diagonally inward beside the pillars for discretion. 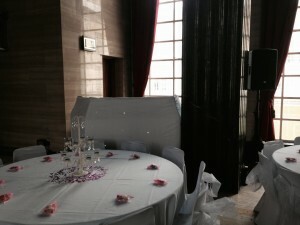 As with other Muslim Arabic Weddings I have done, the stage which would be erected for family photos would need to take prominent place, and I wanted to create minimal distraction with the speakers, but create an all encompassing sound. My choice of positioning was ideal for this. Fereida and I put together a selection of music from the family to ensure that key moments were accompanied by the song choices Fieza and Aziz wanted. There was quite a mix, although a lot of the music was western. Background music early on was chilled, and guests arrived gradually. This was a good thing, as there was a reversal of the programme due to the vehicle breakdown of the caterer. They did not arrive until the end. So…. the formalities of cake cutting, 1st dance and speeches were done, followed by lots of dancing, followed by food! The whole evening flowed, and everyone enjoyed themselves. We were not asked to provide lighting for this wedding, but this did not reduce the enthusiasm of guests on the dance floor.